Chicken coops are increasingly popular. You can’t have a chicken coop everywhere, and it takes some work to maintain one, but you get free eggs. You can share the eggs, too, and even sell them. It’s something you can do at home, and it will make you somewhat self-sufficient. Here’s a guy who build his own coop out of his kid’s old swing-set. 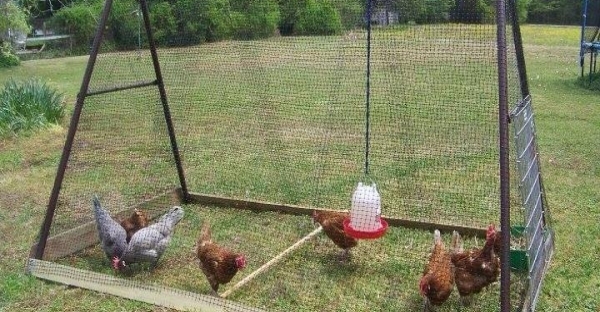 He thought of the project after seeing something a user at Backyard Poultry had done. But he used mostly wood for his construction. It was cheaper, because he already had a lot of wood around his house. He found he was able to use, besides the frame of his kid’s swingset, old fence palings (he still needed more though), pallets, lawnmower catchers, a screen door, bush rocks (he used these to fox-proof his yard), fiberglass, bricks, rocks, and logs. He ended up having to buy some things himself, such as the aviary wire, some nails, screws, hooks, etc., and some treated pine palings. The chicken coop ended up, as you might expect, triangluar. An A-frame based on the swingset. He set the lawnmower pouches in sawdust to serve as nest boxes (he had the hard plastic box-type, not the soft folding bag type that seem to be more common). Unfortunately, the chickens didn’t begin laying eggs. The owner said they had been under quite a bit of stress, as they were rescued chickens. Rescue chickens are those that have been recovered after their previous homes were found to be in violations and closed down to chicken farming. The prices for rescue chickens don’t even cover the costs of the rescue, but they only allow 15 chickens per person in some adoption places (not sure if you would need more). They cost 10 dollars each if you buy up to four (in California at the Animal Place (.org). They’re 7 dollars if you buy five to ten though.